Ever since the "Smart Phone" era began, Samsung has been a key player in it. Samsung launched their first mobile in 2004 and has been ruling the market since. Being one of the strongest mobile manufacturer company, the company has been launching its various smart phones. It has recently developed smartphone running Tizen Os, as an alternative to its Android-Based smartphone. It's come up with another amazing device 'Samsung C7'. It is expected to come out in market by the end of 2016. The Samsung Galaxy C7 runs Android v6.0 (Marshmallow) O.S with Qualcomm MSM8953 Snapdragon 625 chipset. The Samsung Galaxy C7 is powered with 2Ghz Cortex-A53 octa-core processor along with 4 GB RAM giving it very fast smooth functioning. It is equipped with Adreno 506 GPU for handling games and graphic demanding operations. The Samsung Galaxy C7 has 32GB internal memory, which can be further expanded up to 128GB microSD card on its Hybrid SIM slot, thus enough space to store your files and high end apps. The Samsung Galaxy C7 is powered with non-removable li-polymer battery with capacity of 3,300mAh. 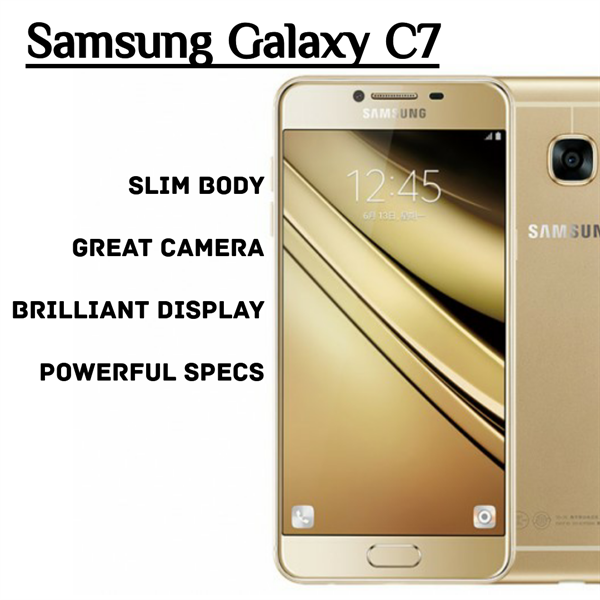 Samsung being the most trusted brand, The Samsung Galaxy C7 has 16 MP rear camera with dual Led flash. It has 8 MP front camera, thus catering young generation's selfie addicts. The camera quality is fairly good. The Samsung Galaxy C7 has many connectivity options like 4G/Wi-Fi with hotspot, Bluetooth 4.2, GPS with Glonass, Bluetooth 4.2 and microUSB 2.0. It supports 2G and 3G along with 4G. GSM SIM is also supported. When it comes to great looks and performance the Samsung C7 is the phone for you. It has attractive design with amazing display, good battery back-up and heavy performance features. It has latest and amazing features thus justifying its price. This article is about the first 4G Nexus Android smartphone by Google. This mobile runs Android 2.3, Gingerbread and has 5 megapixel rear camera and VGA front camera for video calling. Are you looking for a trendy Samsung smartphone? This article contains all information about Samsung Galaxy Ace. Read the article to find out specifications, features, price and availability of Samsung Galaxy Ace. Feel free to print the article for future reference. This article is a hands on review about the Latest Android Smartphone released from Samsung. Complete Specifications as well as the interesting features of this device are being included in this article. Read this article to know more cool features about the Samsung Galaxy Chat along with the price details and availability of this device. In this article we will discuss the complete specifications and review of the new smartphone from Samsung, which is Samsung Galaxy S Lightray LTE. Read on this article to know more what are the features of this Android based smartphone and know what are the pros and cons of this latest smartphone from Samsung, with LTE. Read Samsung Galaxy S Lightray LTE spec, review and price etc. A straight to the point review of Samsung Galaxy Note 800. Also find features and specifications and price information in this article.